"Constructif en Rouge et Ocre"
Founded by Mitchell Feldman in 1996, MFA (Mitchell Feldman Associates) provides radio promotion, media relations, editorial, marketing and career consulting services for musicians and ensembles, record labels, concerts, festivals and other events, presenting organizations and institutions on a retainer or project basis. Mitchell Feldman has a profound knowledge of and passion for music. There are very few radio promoters or publicists who can match him in the field and even fewer who provide both services equally well. ...one of those rare people in our business who truly loves the music as much as doing the work and understands that that while the phrase "marketing art" is an incongruous one it's something that is still possible. ...a true pro-always prepared, impeccable taste, knows his music and his stations. It's alwyas a pleasure working with him. They say that the devil is in the details and Mitchell is living proof. In the 15+ years that I've been involved with the marketing of airplay information products, I can't remember anyone better than he at exploiting every possible advantage to be gained from intelligently using the tools we provide in order to build airplay momentum on a project. He knows the ins and outs of our systems better than we do and uses that knowledge to the benefit of his clients. Mitchell Feldman has a unique place in the world of music-he has ears for great music, a gift with words, is a joyous communicator and on top of that he knows how to cook! 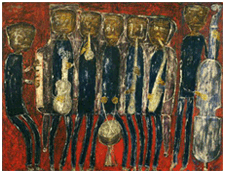 MFA's clients are primarily jazz artists and organizations. The firm also promotes Latin jazz and World music artists, recordings and events. Prior to forming MFA, Mitchell Feldman spent 20 years in Atlanta and New York City as an arts and entertainment marketing communications and media-relations specialist on the staffs of the City of Atlanta Department of Cultural Affairs; the Office of Atlanta Mayor Andrew Young; the Cultural Olympiad of the 1996 Centennial Olympic Games and the City of Atlanta Office of Olympic Coordination; and in Manhattan at the cultural institutions The 92nd Street Y and Symphony Space and the classical music PR firm Hemsing Associates. Please see About MFA for more information. With 30 years experience as both a published music journalist specializing in jazz and a jazz radio program host and producer, Mitchell Feldman not only has long-standing relationships with leading members of the jazz print and broadcast media in the US, Canada and Europe but also knows what it’s like to be on the receiving end of a call from a publicist or a record promoter. This, as well as a passion for music and exceptional “ears” has led to a reputation for quality and a level of trust between MFA and the industry. MFA does not ensure coverage or airplay of the music we promote. But we definitely guarantee that when a CD in an envelope with our logo arrives the recipient – whether an editor, writer, DJ, music or program director – knows that while the music ultimately might not appeal to him or her, it’s definitely worth checking out. At MFA we take our work seriously and your music personally -- we treat our clients’ projects as though they were our own creations. When contacted we’ll consult with you as long as necessary before a promotion services agreement is signed (and sometimes one isn’t!). Once MFA has been retained we start working for you well before the “official” starting date of the promotion (with radio usually the promo mailing date). While we do like our “down time” we’re on call for our clients 24/7, seven days a week should issues arise – we don’t keep “banker’s hours” since musicians don’t lead a 9-5 lifestyle! We also don’t take on a ton of clients just to generate income. Experience has proven that promoting 4 to 5 stylistically diverse projects at a time are the most we’ll do. We also don’t start promotions right on top of each other but rather schedule them to launch so that if running simultaneously they are at different stages (i.e. beginning, middle, end). This way a) one client is not competing with another for the same print coverage or radio adds and b) we can ensure that we have the time and energy to devote to your music, respectful of how much blood, sweat and tears went into creating it and how major a financial investment a radio promotion or publicity campaign is for a working musician, band, recording label or non-profit arts presenter. Please take some time to explore our website, and if what you found out about MFA resonates with you and you think we can help, please give us a call. If you have a CD, tour, festival, concert or any other form of musical event you want promoted, need promotional materials developed, or just want to use us as a sounding board to get some career advice, MFA is here for you.